The new Dublin City Council Development Plan (2016-2022) will be finalised in September this year. Drafting the plan offers local councillors the opportunity to make significant decisions on the future direction of the city. Unfortunately, for some it is simply an opportunity to pander to nimbyism as well as trying to force through illogical measures. “To prohibit the further expansion of off-licences or part off-licences unless a compelling case can be made that there is not an over-concentration of such uses in any one area. In this respect, any application for an off-licence/part off-licence should include a map of all such establishments located within a 1km radius of the proposed development. In relation to stand alone off-licences an audit of the existing off-licence floorspace provision within 1km and an analysis of the need for the proposal in the locality shall be provided”. This is a serious additional layer of restrictions on what is an already heavily regulated retail activity. This move is separate to the restrictions proposed in the Public Health (Alcohol) Bill. It could prevent new outlets opening or existing retail locations branching into off-premise alcohol sales. It is a one-size-fits-all approach that ignores local employment, the specialist nature of products sold and changing consumer patterns. It shouldn’t be seen as the panacea for tackling public drunkenness and anti-social behaviour. It is contrary to the stated ambition in the draft development plan to “actively promote and protect the range of specialist shops within the inner city, which contribute to the character and attractiveness of the city as a destination for shopping”. Imagine specialist whiskey, wine or beer shops being prevented from opening because there’s a generic off-licence somewhere within a kilometre of their proposed location. At the very least if the proposal remains, it would add significantly to the high costs of applying to open a shop. Craft beer has been gaining a significant foothold in the likes of Spar, Centra and smaller Tesco stores. This proposal could limit stores such as these moving into off-sales, if they aren’t already selling alcohol. It also could limit new stores opening and offering alcohol sales. They already have to cease sales by 10pm and can be prevented from sales at the discretion of the Guards. This proposal is not based on empirical evidence or regulatory logic. Why not let the market decide on this one? Off-licences are a source of employment, collect considerable duties and VAT for the State and would pay commercial rates to the council. Many are supporters of independent craft producers, providing them with a sales channel for their products and an important alternative to pubs. Fourth of July for Americans is a BIG deal. Understandably so. I’ve been lucky to have been in the US for a few Independence Day celebrations. It’s barbecue, outdoors and fireworks. Hot dogs feature more prominently than beer. There’s even a nationally televised hot dog eating competition broadcast live from Coney Island, New York. Today’s winner apparently polished off 70 in the allotted ten minutes. Of course many bottles and cans of Sam Adams or Yuengling will be downed today. Beers marking the festivities or ‘Murica more generally will be popular today. Even Budweiser has been renamed America for the summer (more on that another time). Needless to say IPAs will be drunk in commemoration of an American triumph over a British style. Is there a better or more symbolic way for a craft beer drinker to mark the 4th? Americans don’t just like things big, they like them bigger. 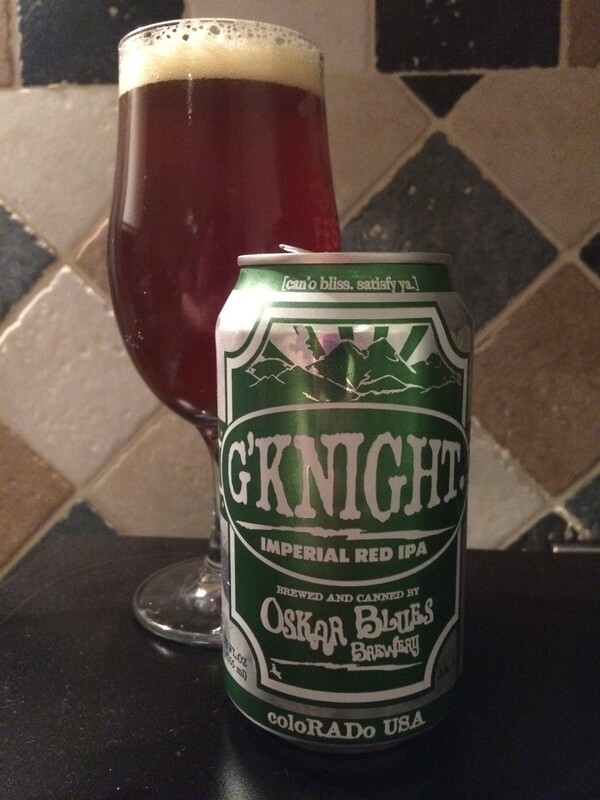 So why not turn to an imperial red IPA from Colorado’s Oskar Blues. 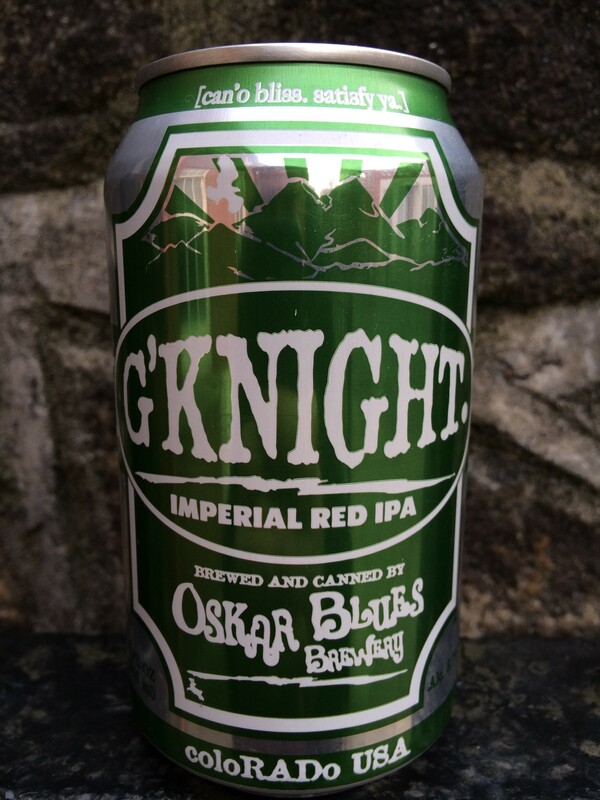 At 8.7% abv, G’Knight demonstrates significant home-grown American heft. It’s name captures that the events 240 years ago when the 13 original states said goodnight and good luck to George III’s “repeated injuries and usurpations, all having in direct object the establishment of an absolute Tyranny over these States”. The beer pours a clear, burnt orange and rusted copper colour. There’s plenty of thyme and other herbs alongside pine on the nose. With IPAs these days all focuses on trying to extract as much fresh fruit aromas, it is almost somewhat pleasing to revert to the old-school pine notes. This beer is all about full-on bitterness and flavour. It finishes dry, spicy and herbal. It’s chewy too, at times a little astringent. The warming alcohol notes suggest that this beer would be better enjoyed at this time of year in doors with the a/c cranked up, except if like me you’re enjoying the changeable Irish summer. There’s sweetness in this beer and believe me you subconsciously go searching for it. You need something to cut through the bitterness. It’ll be hard to drink anything after this as your palate would be destroyed. Then again, a BIG BEER is appropriate for the day that’s in it.